A perpetual student of life, Josh is always teaching himself new skills and is currently learning to play the piano and studying computer coding and 3d animation. 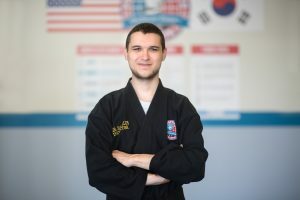 Joshua has his 2nd Dan (2nd degree black belt) and has competed in tournaments, placing in both Forms and Sparring in 2005-2006. In addition to his PMA family, Joshua is married, has four cats and a pit bull! Odin has been practicing Martial Arts since he was 5. 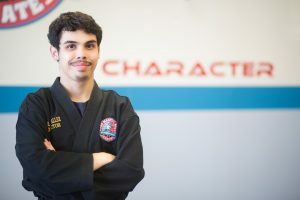 He is passionate about helping people of all ages to empower themselves with martial arts, confidence and character building. He continues to train everyday and believes that martial arts is not only a skill but a lifestyle. As a military kid, Wendy Napolitano has lived all over the world! As a young child living in the Philippines, Wendy started taking karate classes and has continued to study every since. Today, Wendy is a Dan, or first degree black belt, and has competed extensively, taking 2nd and 3rd place in Kata (forms), 4th place in Kihon (basics) and 2nd place in Kumite (sparring). 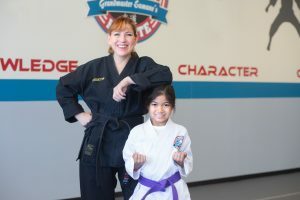 The benefits of martial arts training for Wendy are too many to list, but she believes that ultimately, training is practice for life and helps students discover that there are multiple solutions to any situation they may find themselves in; so, in real life situations it helps students think broadly and find alternate solutions to any complex problem. Wendy believes in working with every student where they are and helping them improve. Her favorite saying is “every black belt begins as a while belt!” When Wendy is not at the dojo, she can be found spending time with her husband of nearly 30 years and two adult children. Wendy’s varied interests include quilting and golf.